New Report Finds Pedestrian Toll In India May Be Significantly Undercounted : Goats and Soda A new study finds that the government count of pedestrian deaths may be far too low. Our writer shares a very personal perspective. Indian villagers walk past an overturned motorized rickshaw. 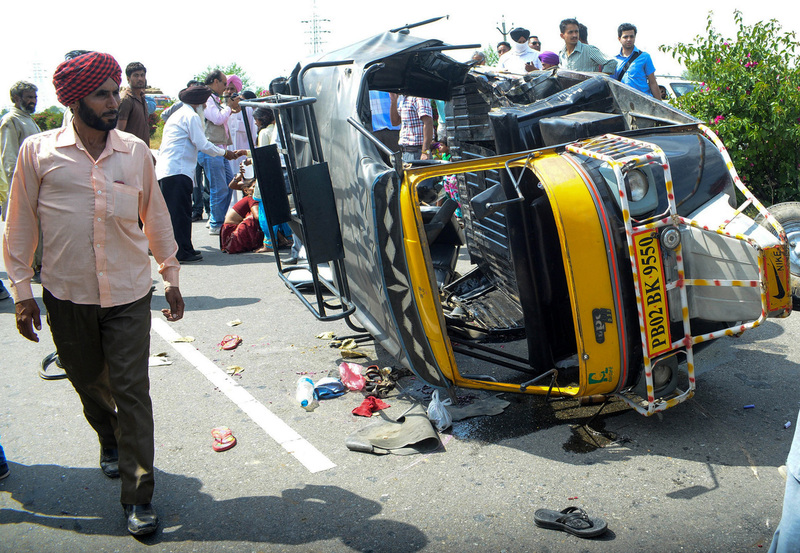 A few years ago, on a hot August day in Lucknow, India, my mother and father were crossing the street when an auto rickshaw — a three-wheeled motorized vehicle — hit her with such force that she slammed into a road median several feet away. The driver left the scene as soon as he had hit her. My father didn't think of reporting the matter to the police; it would have been a hassle, he thought. Indians believe that the police are usually corrupt and a waste of time. Also, at the time, my mother needed medical attention more than anything else. He took her to a hospital, where a doctor told her she had fractured her hip. She has been bedridden ever since. My mother is very bitter about the traffic in general in India. She often says, "If you want to commit suicide, just go take a walk on a busy street." Maybe she exaggerates to some extent, but if you read the local newspaper, it seems there is not a single day without traffic-related mishaps. And the number of pedestrians, cyclists and motorcyclists who lose their lives may be greater than anyone realizes. The Johns Hopkins Bloomberg School of Public Health has conducted a study to look at the number — and nature — of traffic deaths in southwest India. The surprisingly low figures of pedestrian deaths reported by the government in India made the researchers believe that something was wrong. Johns Hopkins conducted its own research by looking at every traffic-related accident report in the police stations. In the district in southwest India that was examined, with a population of 4.7 million, the National Crime Records Bureau reported that of the total traffic fatalities in 2014, 9 percent of the victims were pedestrians and 37 percent were motorcyclists. But when the Hopkins researchers looked at the actual police reports, they came up with a significantly different breakdown: 21 percent were pedestrian deaths and 49 percent were motorbike riders. Their suspicions were also aroused by the breakdown of the 140,000 traffic deaths reported by the Indian government in 2014. The government said only 5 percent of the victims were pedestrians. In countries in the same economic bracket as India, the rate of pedestrian deaths is usually estimated at 40 percent. "Our study suggests that taken together pedestrians and motorcyclists account for the vast majority of traffic deaths in India," says Kavi Bhalla, an assistant professor in the Department of International Health at the Bloomberg School and the study's lead author. Why the discrepancy? The researchers aren't exactly sure. It could just be that the official statistics look at the vehicle driven by the person responsible for the accident rather than how the victim was traveling — by foot, by motorbike, by car. Whatever the reason, Bhalla believes the government will not take major steps to protect its pedestrians, bicyclists and motorcyclists if the official statistics don't reflect the true number of fatalities from these categories. I asked Bhalla about his ideas to make pedestrians and cyclists lives' safer. He said, "The government should spend more money on building better infrastructure such as sidewalks, raised crosswalks and designated lanes for different kinds of traffic, but they can do this only if they represent the number of deaths correctly." Even without reading the study, I know that it's tough being a pedestrian in India. When I go back to India to visit — I've lived in the U.S., with its spacious sidewalks, since 2003 — I feel as if I'm taking part in a hurdle race. I have to stay alert at all times about what I am stepping onto — a person, a sleeping dog — and be aware of what is going to hit me from behind. Some people ride their motorbikes on the sidewalk. Or a raging cow might attack. My mother says, "Even if I could walk, I wouldn't feel safe walking on a street full of speeding cars, trucks, auto rickshaws." This study makes me long for my boyhood days — there weren't any sidewalks when I was growing up, but there was much less traffic. The biggest problem I faced was one that didn't make it into this new report: I was out on my bike and a donkey was blocking the way. The beast didn't move an inch, causing me to fall off my bike. Deepak Singh is an author of a forthcoming book, 'How May I Help You? An Immigrant's Journey From MBA to Minimum Wage.' He tweets at @deepakwriter.